Get ready for your heart to burst with excitement with Heartburst, a fruit themed slot developed by Eyecon. If you like the feeling of nostalgia when playing slots, then you will for sure enjoy this one. Starburst has the old-school feel of a traditional fruity but with a modern technology twist and can be played on your mobile phone, tablet or laptop. You can play it from the comfort of your own home or on your commute to work! It's a fairly straightforward slot that is easy to play and is also easy on the eye (no horrible distractions). It's bursting with fruity colour and it's such a fun online slots casino game to play. 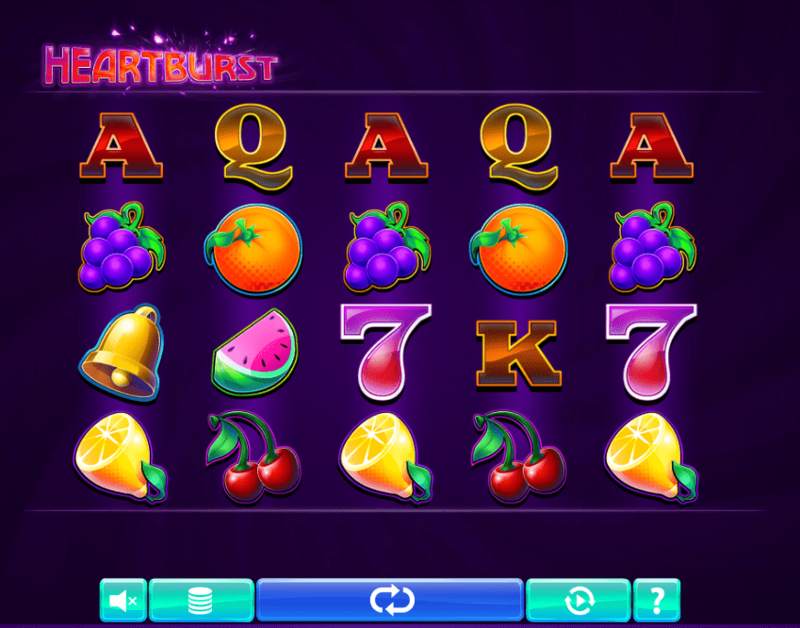 Heartburst is a 5 reel, 100 payline slot with a classic fruit theme. The fruit theme may be a bit overused, however, a bit of nostalgia is always great. The colours in this slot are exceptionally bright - almost blinding - so you may need to put your shades on! The reels are placed behind a plain dark purpley-blue background which makes the fruit symbols stand out. The symbols include a bunch of tasty grapes, a juicy watermelon, a tangy orange, sour lemon, sweet cherries, lucky 7's, golden bells and colourful card suit symbols. We urge you to play the best-rated online slots from our guide today! The Wild Symbol - The red love hearts are the wilds in this slot. The wild replaces all other symbols on the reels apart from the scatter. Wilds will land on odd-numbered reels and will expand to cover the whole reel creating some delicious wins. You'll also gain a 3x multiplier here. The Scatter Symbol - The scatter symbols are the lucky 7's. Landing a minimum of 3 lucky 7's will unlock the free spins round. Free Spins - Landing 3, 4 or 4 lucky 7's will award you with 15, 20 or 25 free spins retrospectively. The free spins round can also be retriggered up to 15 times allowing you make lots of wins. A total of up to 375 free spins can be given out here. Gamble Bonus - Gamble your winnings for a chance to win double, or go home with nothing. To play the gamble bonus, simply guess correctly from the 2 options to double all of your winnings. Fail to guess correctly and you will lose everything. You have the chance to gamble up to 5 times in this round! If you like traditional fruit slots then you will enjoy Heartburst. Hopefully, your heart will burst with joy as you win! There's plenty of opportunities to win with this slot. There are lots of free spins up for grabs (up to 375 in the free spins round) and a chance to double all of your winnings up to 5x with the gamble bonus feature. Had a change of heart? Why not try Astro Pug?